Easy to grow from seeds, Pot Marigold’ is Calendula officianalis also known as the English or Scottish marigold. Grown widely in cooler climates they were originally used for culinary purposes (they were thrown into the cooking pot). Also used for herbal skin remedies and now for cosmetics. In the garden they make a colorful addition to the border, however in Australia Calendula officianalis can suffer a little in the hot dry conditions. Plants will reach a height of around 25cm. Flowers are golden with yellow centres. Excellent in the garden border, they also grow well in containers and hanging baskets. Used as an annual seeds can be planted in spring or in autumn. 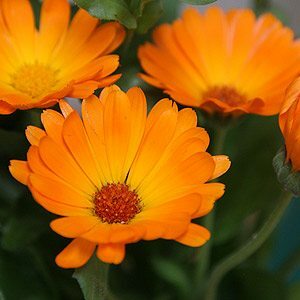 Pot Marigold grows well in a humus rich moist soil. In good conditions where the soil does not dry out C. officianalis will self seed, providing an ongoing supply of flowers. Growing Pot Marigold from seed. Seeds are readily available for sale and if fresh germinate easily. seeds can be spread on top of a good quality potting mix or a prepared garden bed and covered lightly, If sown in trays try a fine propagating mix and cover lightly with vermiculite. Seeds need to be kept moist and can be transplanted to the garden when they reach 5cm. we like to use a liquid seaweed fertilizer one a week until plants are established. Best in a position where it is protected from hot afternoon sun, however this is a Marigold that requires good light to flower. Plants can be deadheaded to promote a second flush of flowers.